Stephen Sackur speaks to Mikheil Saakashvili. He's been stripped of Ukrainian citizenship and is stateless. So Is this the end of Mikhail Saakashvili's political career? In the age of Donald Trump maybe the world is getting used to international politics delivering the unexpected. HARDtalk's Stephen Sackur speaks to Mikheil Saakashvili who served two terms as President of Georgia. He then abandoned his home country to take citizenship in Ukraine, serving as a regional governor until he fell out spectacularly with the Ukrainian President. Now he's been stripped of Ukrainian citizenship and is stateless. 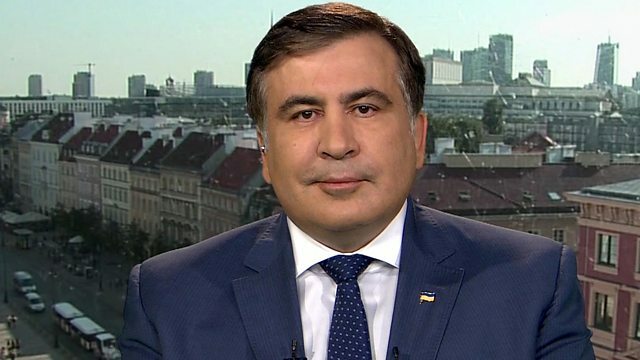 So Is this the end of Mikhail Saakashvili's political career?